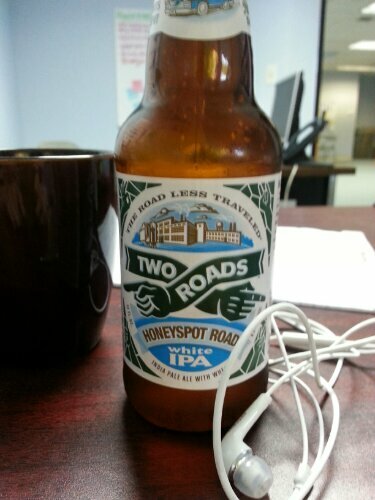 One of my new Connecticut favorites has become Two Roads Brewing Honeyspot Road White IPA. They decided that some of the usual spice that gets put into an IPA was sometimes too much – and if they laid off a little bit, the beer could be a little more refreshing. I liked the way the hops and the wheat were balanced. Whenever I try any beer with the word white in it, I get nervous that it’s going to taste too fruity… or be just too filling. This beer isn’t that. This makes for a nice white IPA that you can have two or three of if you want – and still feel refreshed. There’s just enough wheat to make the hops taste smooth and to add a nice hint of wheaty flavor – but too much wheat to turn off a hop head. I’m excited to try more Two Roads beer, and you can look at more to try here. The Staghorn Oktoberfest is our new New Glarus fall beer, and the Old Fashioned’s beer of the month… which means 2.50 pints and 9.00 pitchers. We went for the pitcher. If I didn’t have a soft spot for the brewery that only sells in Wisconsin and makes one of the greatest staple go to beers in America, this review might be worse. I want to say that if you’re looking for a full bodied, malty Octoberfest that’s edgy and new – this is not your beer. This beer is light, tastes like you want an Octoberfest to taste, is not too smooth & not too coarse, and most importantly… you could literally drink this all day long. In a state that has an Oktoberfest Festival probably within a half hour of any given place at some point between September 1st & October 31st (that become flooded with Miller Light drinkers) – this beer works. 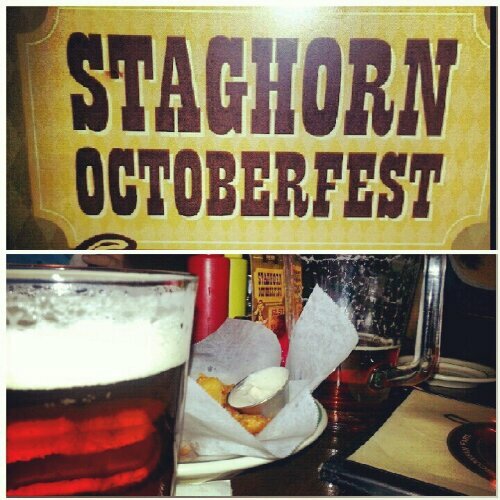 The Staghorn Octoberfest could easily be the beer we drink inbetween stronger, thicker beer to hydrate and cleanse the pallet. It’s a million times better than your average “water beer” and provides a goos introduction to Octoberfest for newcomers. So although it’s really not for me, it could be for you, or some of our friends that we bring to Oktoberfest with us this year. I’ve spent a ton of time writing about my experience at different breweries, what the people are like, and how I feel about the whole experience. I’m going to broaden the topics a bit. That’s because I want to talk about the experience I have when I really, really appreciate a good beer (and really, really don’t appreciate a bad one). I had a long weekend… and busy start to the week at work. All I really wanted to do was sit down, watch the xfiles, and have a drink. I was overjoyed to see that I still had Sixpoint Resin in my fridge. It’s one of my favorite go tos. 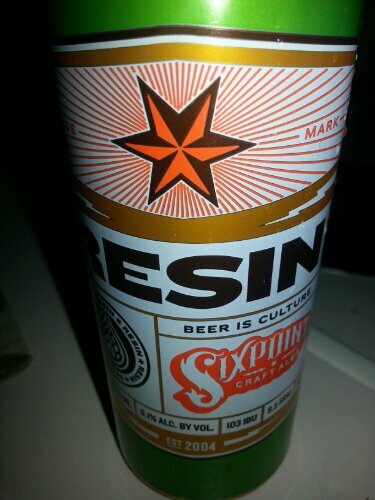 Sixpoint Resin comes in at 9.1 ABV, so don’t expect to have more than one or two if you’re out, but it really hits the spot at the end of the night. This one is smooth, of medium weight, and serious flavor. The beer gets it’s name because the brewmasters extract hop resin and heat it to dissolve in the beer to make the beer more concentrated and flavorful. They call it “dangerously easy to drink,” and I’m on board with that. If you’re a beer drinker and you haven’t tried it – you’re missing out. This is certainly a brewery I’m happy to live closer to. I’m going to call this one pleasantly hoppy – and just malty enough. 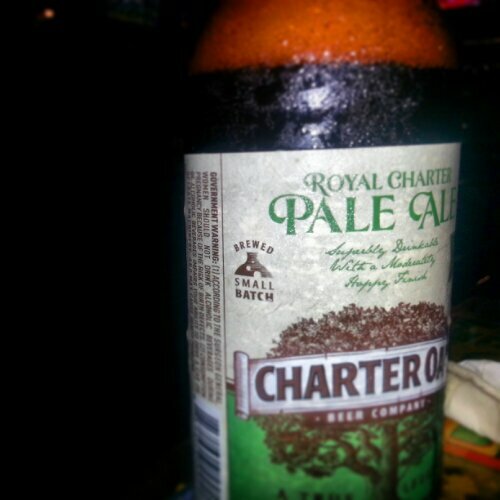 Charter Oak is a new Brewery in the Norwalk area I just happened to try tonight. I have the Pale Ale. You’ll like it if you like a good light amber or brown ale and are looking for something with a hoppier edge – but not for anything too crazy. This is yummy so far and I’m looking forward to trying their IPA and their Brown Ale. Cheers, happy Saturday, & happy primary GOTV everyone!